Alien species get more and more attention. In some countries, like at the moment in Brazil (http://tudoglobal.com/blog/editorias/73850/pais-se-preocupam-com-surto-de-meningite.html?doing_wp_cron), Lissachatina fulica is a real pest, causing public health problems, and under public debate. However, there are several other species which remain less noticed because they have less economic impact. Rumi et al. (2010) have made a summary of all records in literature from a number of South American countries. They found 42 species of terrestrial gastropods recorded. On the basis of museum collections, they were able to add several records for 8 species from Argentina, one from Colombia, and one from Peru. Thus, although the title of their paper focusses on Theba pisana in Argentina, it is of a much wider scope. Rumi, A., S? ?nchez, J., & Ferrando, N.S., 2010. Theba pisana (M? 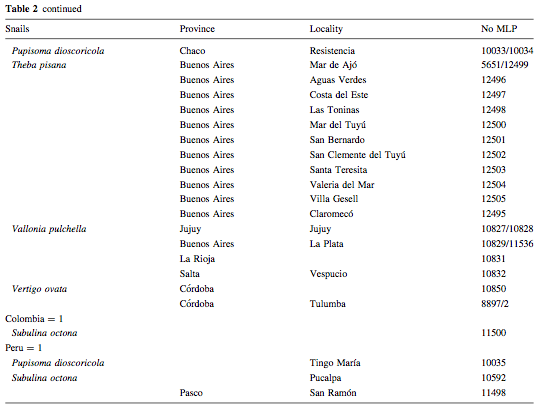 ?ller, 1774) (Gastropoda, Helicidae) and other alien land molluscs species in Argentina. – Biological Invasions 12: 2985-2990. This entry was posted in Uncategorized and tagged argentina, brazil, chile, colombia, helicidae, literature, paraguay, peru, uruguay on January 30, 2011 by bramb.